Saving Iceland can now reveal evidence that shows clearly that the two police forces are not telling the truth about their dealings with Kennedy. 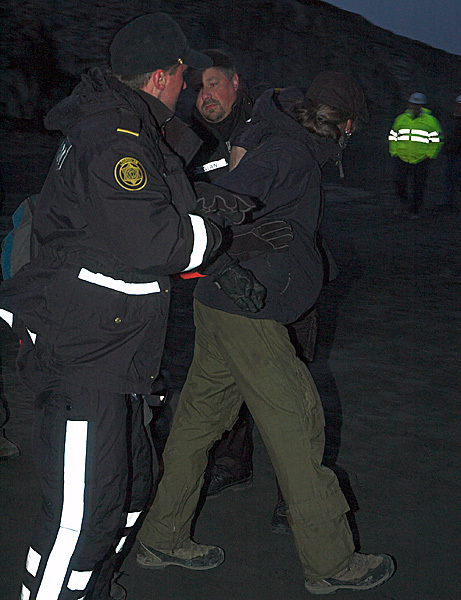 The top photograph accompanying this statement shows two Icelandic police officers grappling with Mark Kennedy during a Saving Iceland action that took place on 26 July 2005 at the site of the Kárahnjúkar central dam. Clearly the incident pictured shows that the Icelandic police most certainly had “dealings” with the British spy. 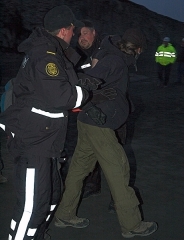 Furthermore, there are numerous witnesses to the event when the Icelandic police detained a number of Saving Iceland activists at Kárahnjúkar, also in July 2005, and the officers collected the passports of the activists in order to register and photocopy them. Kennedy was one of those whose passport was confiscated in this manner by the police. The records of these passports are available to the authorities, unless they have been tampered with by those who are authorised to access the records. The above shows that the two respective police forces are lying about their dealings with the British police spy. These dealings in fact turn out to have been considerable, although what has been photographed and entered into police records may just be an indication of much deeper involvement of Icelandic authorities. Who was Kennedy’s runner in Iceland? It is standard police procedure with the UK police that a spy like Kennedy will always be backed up by a “minder”. This is a police officer which follows the spy where ever he goes at a “safe” distance and which the spy can always get in contact with 24 hours round the clock. Kennedy himself described this procedure in an interview in the Daily Telegraph. According to Kennedy this agent would travel on his trail where ever he went abroad. 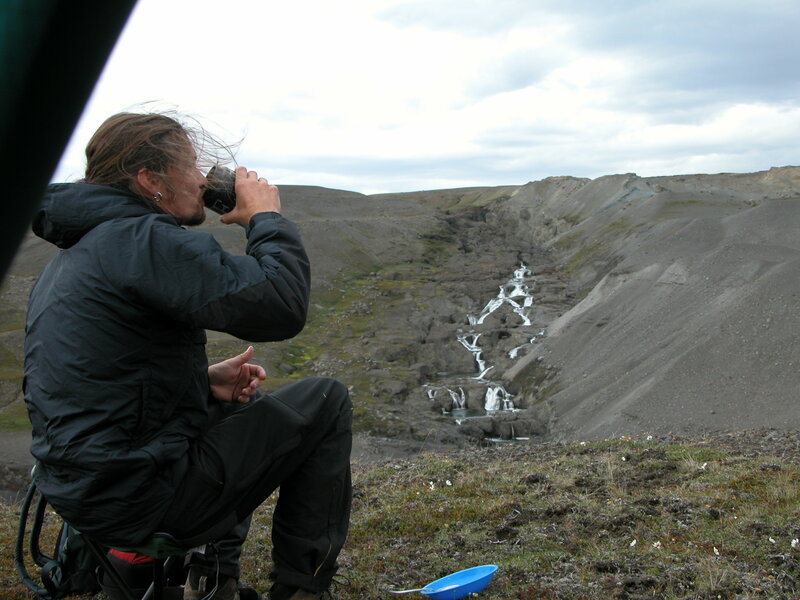 One can assume that during Kennedy’s stay at Kárahnjúkar this “minder” agent will have been based in a hotel at Egilsstaðir, the town nearest to the Kárahnjúkar dams, or at Hallormstaður forest, or possibly even, in the event of close collaboration with the Icelandic authorities, in the work camp village at the dam site itself. It is more than likely that if the British authorities notified Icelandic authorities of the infiltrator in the Saving Iceland camp that, rather than jeopardize the guise of Kennedy, the Icelandic authorities will have been in more regular contact with his “minder”. The fact that the Icelandic police find it necessary to use clumsy lies to cover over their involvement with Kennedy and his superiors, indicates that they are responding to orders from above to suppress information that would potentially seriously compromise Icelandic and UK authorities. So far the the National Commissioner of the Police of Iceland has refused to answer the question posed by the National Broadcaster about if the UK police notified Icelandic authorities about the Kennedy infiltration of Saving Iceland. Despite the assurances made in January in parliament by Össur Skarphéðinsson, Minister of Foreign Affairs and also Ögmundur Jónasson the Minister of the Interior, that they would do their utmost to uncover the truth of this ugly case they have so far done nothing to come clean about this considerable significant breach of human rights and of Icelandic and international laws. At a meeting with the Minister of the Interior Saving Iceland founder Ólafur Páll Sigurdsson requested that he be given access to all official records of the dealings of the police with Saving Iceland, including all records of official spying carried out by the police about himself and other environmentalists involved in the struggle for the preservation of the Icelandic environment. The Icelandic authorities are deliberately dragging their heels about the Kennedy case. So far nothing has been forthcoming from Icelandic authorities but sophistry, evasions and lies. The Ministry of the Interior has stated in correspondence with the legal representative of Saving Iceland that no disclosures are to be expected until the report from the National Commissioner sees the light of day. From the tone and context of the correspondence it is implied that it may be a considerable amount of time until the report will be made available. Hence it can be concluded that the authorities are using this report as tactical means to delay and defuse the serious consequences that the unraveling of the truth may have. This is in direct contrast with both the German and Irish authorities. Both the German and Irish police have made official statements in which they admit their awareness of Kennedy’s operations within their jurisdictions. These arrogant tactics of deliberate bureaucratic stalling and red tape sophistry are nothing new when it comes to Icelandic authorities when they want to deflect attention from inconvenient issues and delay the course of transparency and justice. The reluctance of the Icelandic authorities to own up to the truth in the Kennedy case reveals yet again how this government has far from discontinued the tradition of unaccountability and repressive methods of former Iceland governments. This is most evident in their continued political repression of Icelandic radicals and specifically the new powers of proactive investigations that the Minister of the Interior is attempting to hand over to the Icelandic police. Recent history shows irrefutably that the Icelandic police can not be trusted to not abuse such powers when it comes to legitimate political groups opposed to government policy. New regulations are not likely to have any more effect on a police force which has grown accustomed to routinely ignore and set aside current legislations regarding the rights of citizens to protest, even clauses dealing with the sanctuary of privacy in the Constitution. The Saving Iceland network demand that the Icelandic authorities desist from this game of lies and evasions and immediately reveal the facts about not only the Kennedy case but all their records of dealings with Saving Iceland and the spying that they have conducted into the affairs of Saving Iceland and the individuals in our network. We call on all those who have voiced concern about this blatant violation of civil and human rights and who have expressed their wish to see the truth about this case to mount pressure on the Icelandic government to discontinue this travesty of justice. The second Grapevine article link is broken. Here’s the real link.